Dawn Calabia joined Refugees International in 2004. Ms. Calabia follows executive and legislative branch developments, works to increase RI’s impact in Congress, and provides special assistance on RI’s statelessness, Burma, women’s rights, and climate advocacy. Ms. Calabia has 30 years of experience with foreign policy analysis, human rights issues, and public advocacy. She served over ten years with the United Nations, as Acting Director of the United Nations’ Washington Information Office and as External Relations Director for U.S. governmental and non-governmental relations for the UN High Commissioner for Refugees. Earlier, she was the Director of Refugee Policy and Development for the U.S. Catholic Conference Migration office, one of the country’s oldest service organizations for refugees and asylum seekers. Ms. Calabia worked on Capitol Hill for eleven years as a staff consultant to the House International Relations Committee specializing in refugee, human rights, and development issues, and as the senior legislative staffer to Representative Stephen J. Solarz (D-NY). 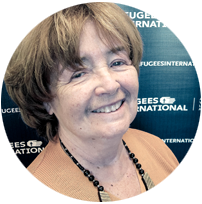 One of the founders of the Women’s Refugee Commission, housed at the International Rescue Committee, Ms. Calabia has led numerous fact-finding missions to Central America, Southeast Asia, South Asia, and Africa. In December 1996, she was honored by President Clinton for her human rights work with refugee women and children. She holds a Master of Social Services degree from Fordham University and a Bachelor’s degree from St. John’s University in New York.